Anyone checking out TNT's 'Claws'? I'm a DAY ONE Claws fan. Niecy Nash...oooh lawd. I thought she was thick on The Soul Man! I'm a few episodes behind so i'll report back when i catch up. Another interesting show I've been peeping for some time. 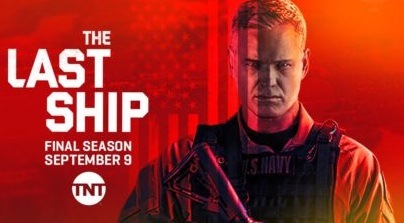 This time around, TNT's The Last Ship is in its Final Season and starts off the first episode with a bang(! )… or should I say, a cyber sneak attack on a AEGIS destroyer group while moored at dock during naval festivities. This episode plays on a Navy captain's worst nightmare, particularly a female ship captain where after her ship is incapacitated, the invasion continues with a DFA (Death From Above) air attack. [paraphrasing]"Negative! I'm responsible for every soul onboard. We won't be of much use on the bottom of the sea. Our job is to prepare for the battle to come." The soldier who lead the attack reports to his mysterious superior who inquires, "...and the American fleet?" Haven't seen a single episode of this period piece but I absolutely, positively love the look and feel of the television ads that are floating on-the-air! ...and I am diggin' this vintage styled poster from HBO's The Deuce! The look and feel of this period television show is similar to what I witnessed as a kid up in the 70s in New York. Can't wait to see this! My wife and I loved the premiere! We haven't taken the time to invest in it, but we want to. It's on season 2 now so that's going to be a great binge watching session. I know, right? 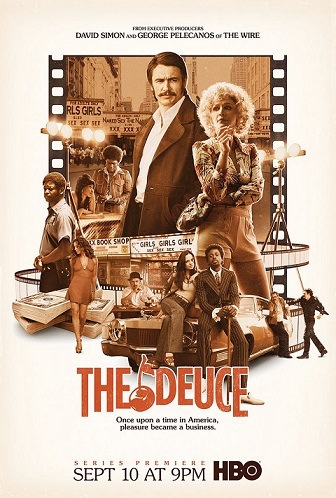 I'm just geeking out over 'The Deuce' television ads with the Barry White tracks thrown in! 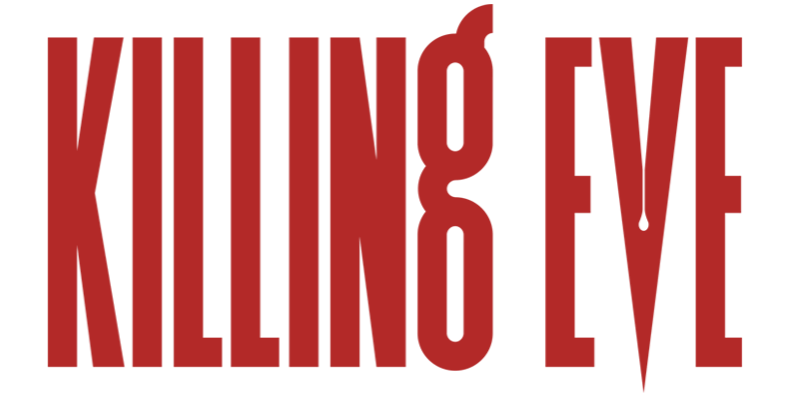 Sooo-o-o-o many great shows out there with great casting, moderate to high production values and art direction and not even enough time to see them all! A lot of shows out there that I appreciate that haven't even mentioned yet. It's almost a Renaissance of sorts; the shows with great success really pay attention to what's trending, and what fans really want to see and hear in entertainment. Television shows that get cancelled in this day and age have to really work hard to put substandard material out there. According to Entertainment Weekly, HBO's 'The Deuce' just got cancelled despite its beautiful production. Cancelled before they even start the 3rd season. I guess not enough people were watching Season 2. That may not be the case. The decision seem to have more to do with politics than anything. If you read the article, the decision had something to do with drumphf gettin' back at the show's creator because of some 'beef'. 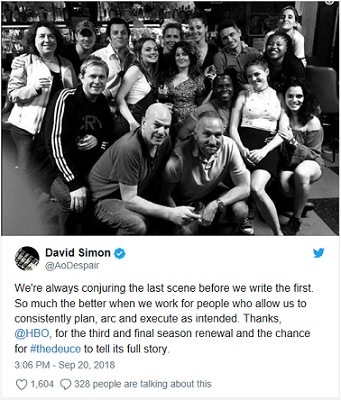 If you're a television show creator fortunate enough to have a critically acclaimed series*, why wouldn't you want to take the series beyond a 3rd season? The benefits of keeping a tv show on-the-air far outweigh the disadvantages of not being on-the-air; a possible advantage would be to keep your entire production team employed. Another would be the accolades your actors will receive from your peers. Another possibility could be a spin-off series... I mean, the possibilities could be more than anyone can imagine. Simon also made headlines in June by getting his Twitter account temporarily revoked after slamming Trump with a comment that sounded to some like a death threat (“You should die of a slow moving veneral rash that settles in your lying throat”). This is why I believe the show was cancelled considering that drumphf was a player in the middle of the real estate market in Manhattan, New York unfettered by law [read: corruption] and who he was dealing with. I get the impression that drumphf doesn't want any potential stories told about the real estate market he was part of during that era that may generate greater distrust in him that already exist. 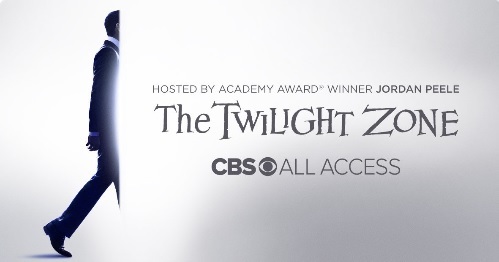 Personally, I love the look and feel of the show because I've seen it, walked through it, smelled it, felt it. I am very familiar what it was. I really would like to see what 'The Deuce' has to say about that time period. There is somewhat of an advantage to having a shortened set of episodes... the production team can get straight to the point instead grindin' episodes week after week; Now, the production team can treat this fantasy series like a full motion picture... Hollywood style! Looks like this is it, folks! TNT's 'The Last Ship' winds down its last two episodes. Our villain, Tavo, leader of Gran Columbia has decimated the last remnants of the southern Atlantic American Navy except one lone AEGIS destroyer to defend against a clear and present threat at sea, however, no one can identify it. 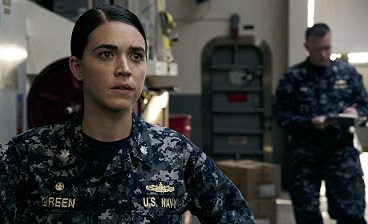 Commanding Officer Kara Green, of the beleaguered USS Nathan James must lurk out of sight from a perceived Battleship that will ultimately determine the last sea battle that could turn the tide of the conflict in the season finale. Commander Green wants to sink this mysterious battleship after her ship took a couple of shots off the starboard bow of the USS Nathan James. This very, very, very, short clip from this past weekend's Saturday Night Live broadcast called "Them Trumps" had me nearly coughing up phlem from laughing so hard. Take a look at it and you'll see why. He's in the Zone. Get in the Zone.